I was sent this book by Inked Rainbow Reads in exchange for an honest review.Once again a captivating opening sequence which seems to be coming what represents a trade mark opening for Ms DiLucchio's novels in this series.This particular book is steeped in knowledge of the education system and this gives it a real authentic, informative and engrossing feel. I found this detailed knowledge made this absorbing book even more realistic and believable. The camaraderie between friends and family added much humour to the mystery as well as entertaining the reader and helping our much maligned hero solve the murder. Each encounter, each conversation, which at first seemed unrelated, gradually began to expose the puzzle. Each scenario was carefully choreographed to slowly expose the perpetrator. Alongside this riveting mystery, where the villain was not revealed until the very end, was the emergence of a very tender bittersweet romance.I found this a gripping and complex whodunit but one filled with great emotion and sensitivity. A really touching and brilliantly written book. I received a copy of this book from Inked Rainbow Reads in return for an honest review.This book was a quick, fun read for me, quite what I expected from DiLucchio in the third book I've read by her, second in this series. Once again, she's written a tightly plotted mystery filled with eccentric characters that seem over-the-top in a book until you look around and realize they surround you in everyday life. However, this go 'round I had a couple of problems with the story, mostly on the personal side of things for Diega. The biggest thing is her feelings for Erin. At no time leading up to their assignation did I ever for a moment think that Diega was interested in her. This, I feel, is a failure on DiLucchio's part. She doesn't give me much insight into how Diega feels about much. I get regret when she thinks of her last relationship, and perhaps a bit of loneliness, regardless of the fact she's trying to convince herself that being alone is okay. But most of her interactions with Erin I read were imbued with a dispassionate feeling. And that's my problem with this book. I'm not sure I felt it as much in the first book, but that could also be because that murder was so much more personal. But I feel that disconnect in more than just her love life. She has an art room/studio in her home, which I would assume means she's a passionate person. That's just based on my own interactions with artists, and could be considered stereotypical, but I don't get any feeling at all that Diega is passionate about her art. Nor her job. I was surprised that two job offers for charter schools came up, because Diega seemed to me more like one of those teachers who shows up and suffers through her day than one who's passionate about teaching children. I'm not sure why I get that impression, but that's how she comes across to me. And I don't think that's the way she's supposed to. Anyway, I actually got the murderer right this time! I'm one for three, so I must be getting better, right? These are fun, entertaining reads. I love Tully, and Felicia, and even Jenny, although she isn't in this one as much. I enjoyed it a lot and am looking forward to reading the next book in the series. After an education official is found dead in Diega’s school she is again under some suspicion and with the help of her trusted band of gal pals decides to investigate. I really enjoyed this book, as I did the first in the series. Diega is a teacher in an elementary school and involved in union politics. 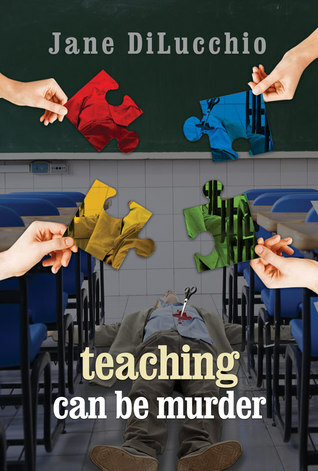 When the man she has been in contact with regarding negotiations is found murdered in the next classroom to hers suspicion falls not only on her but on some of her fellow teachers. Tully, Felicia and Jenny help her look into the life of the dead man, Zeke. He turns out to be anything but a boring bureaucrat and they end up meeting some very shady characters and getting into some danger themselves. The dynamic between the lady friends, all lesbians, is well written. They are all very different, Jenny even more so as we find out! Diega is an interesting character but I think it takes the interaction with her friends, and their diverse backgrounds, to make this story. Diega meets a woman she begins to fall in love with and we see a new side to her. She is in for a lot of heartache but she is a strong woman and certainly up for it. I enjoyed finding out about her life as a teacher in California too and the politics surrounding the school system. It made her a more rounded character to see the passion she had for her job. This was a really good mystery, with plenty of twists and turns. A well deserved 5 Stars.I was given this ARC free by Inked Rainbow Reads in return for an honest review.